(Photos courtesy of Layn Mudder of LPT Images.) Fans and drivers could not have asked for a better race track Friday, August 15th at the Dacotah Speedway. Drivers were racing low, middle and high and everywhere in between. The IMCA Sport Compacts started the night with a 10 lap feature. When the green flag waved, Nic West and Kody Stoxen w ere door to door, racing for the lead. West edged Stoxen to lead lap one but Stoxen's high line around the track edged West for the lead on lap two. Points leader Josh Roehrich slipped by West for second and quickly closed in on leader Stoxen. As Roehrich and Stoxen raced bumper to bumper for the lead, third place West had his hands full holding off Michelle Stoxen and Chance Seelye. Seelye passed Michelle for fourth with three laps to go and challenged West for third. As they crossed the Open Road Honda finish line, Chance Seelye held off a last lap charge from Michelle Stoxen to finish fourth. Pole sitter Nic West finished third behind points leader Josh Roehrich and feature winner Kody Stoxen. IMCA Modifieds hit the track next for a 12 lap concy race. Only the top four cars would transfer to the feature. Starting on the pole, Minot's Josh Wolla pulled away from the field as second place Brent Schlafmann tried to hold off Travis Olheiser. Olheiser, who started sixth, passed Schlafmann for second on lap four. When leader Wolla got loose in turn four, it allowed Olheiser to quickly catch and pass Wolla for the lead the following lap. Wolla kept pace with leader Olheiser but couldn't make the low line stick. Olheiser led the final seven laps to win the concy over Wolla. Kirk Wojahn finished third while Brent Schlafmann finished in the fourth and final transfer position. 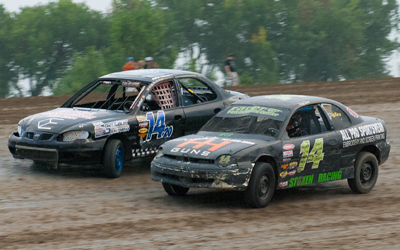 It was a three wide race for the lead in the Hobby Stock feature between Dana Welder, Ben Meuchel and Nathan Messer. Meuchel powered into the lead to lead lap one before Welder made contact with another driver, spun and rolled his car on the frontstretch on lap two. Welder was ok but his car was heavily damaged. On the restart, Meuchel had his hands full with Napoleon's Wyatt Rath-Wald. They raced side by side before Rath-Wald took the lead on lap five. Third place Dustin Herz was all over the rear bumper of Meuchel and took second place on lap six, bringing points leader Brent Vetter with him. Herz and Vetter battled hard for second but Vetter's high line gave him the momentum to complete the pass with five laps to go. Herz was on a backwards slide, losing third to Jaren Wald and fourth to Meuchel. Coming to the Open Road Honda Finish Line, Nathan Messer edged Herz for fifth. Ben Meuchel finished fourth behind Jaren Wald. Points leader Brent Vetter finished second behind first time feature winner Wyatt Rath-Wald. 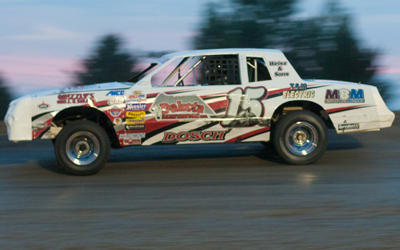 Pole sitter Tanner Dosch held onto the lead in the WISSOTA Street Stock feature. Behind leader Dosch, it was a three wide battle for second between David Falkenstein, John Weber and Scott Gartner. After a series of short cautions, Falkenstein dove low under leader Dosch on the restart. Dosch held off Falkenstein and pulled away from the field. Contact between third place Weber and fourth place Gartner allowed Shawn Volk, Eric Paul and John Fiest to slip by for position. Volk, who started 16th, quickly caught second place Falkenstein and passed him with seven laps to go. Volk quickly erased Dosch's two second lead and was all over his rear bumper as the white flag waved. Volk threw his car hard into turn three and they raced side by side coming to the Open Road Honda finish line. 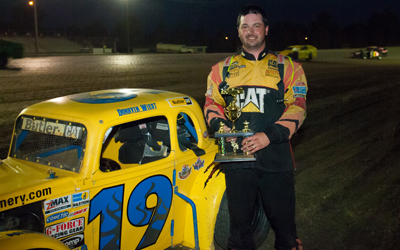 Dosch edged Volk at the finish line to win his second feature of the season. David Falkenstein finished third ahead of Barrett Berg and points leader Eric Paul. Loran Anderson led the field to the green flag in the INEX Legends feature. Anderson had a moment when he got loose in turn four and spun his car in front of the entire field. All 24 cars somehow missed Anderson and the race continued with Dauntae Martin and Donavin Wiest battling for the lead. Martin led the first five laps before points leader Donavin Wiest took the lead on lap six, bringing Troy Hoff with him. Hoff stole the lead from Wiest before a caution reset the field with seven laps to go. On the restart, Wiest and Minot's Shane Williams battled for second. Paul Morman of Wishek made it a three car race before a caution set up a four lap shootout to the finish. Williams took it three wide for the lead on there restart and as the leaders exited turn two, Hoff bobbled and spun his car. Wiest and Williams continued to race side by side for the lead but by using the middle line around the race track, points leader Wiest picked up his first feature victory of the season over Williams. Paul Morman finished third while Brian Schirado and Drew Papke rounded out the top five. Masen Big Eagle and Joren Boyce started on the front row of the IMCA Modified feature. Big Eag le quickly pulled away from second place Mark Dahl as the race was for third between Boyce and Tracy Domagala. Domagala dove low under Boyce and took third on lap two, bringing Jett Big Eagle and Shawn Strand with him. Jett Big Eagle and Strand battled hard for fourth while Spencer Wilson lurked in sixth. Wilson took it three wide, hugging the guardrail, Wilson passed Jett Big Eagle for fourth and continued to race side by side with Strand for fourth. A lap 11 caution regrouped the field and on the restart, Masen Big Eagle and Dahl raced door to door for the lead but Masen Big Eagle cleared Dahl for first and pulled away once again. 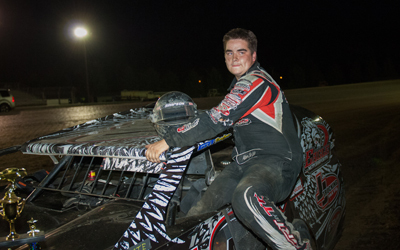 Masen Big Eagle led all 25 laps to win in dominating fashion to win his first feature victory at the Dacotah Speedway. Mark Dahl narrowly edged Jeremy Keller for second at the finish line. Shawn Strand finished fourth while Drew Christianson finished fifth. 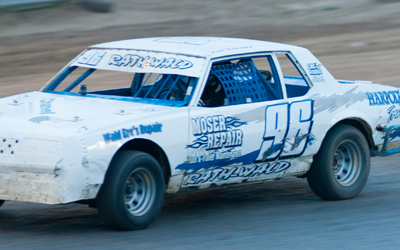 For more information visit us online at http://www.dacotahspeedway.net/ or “LIKE” our Facebook page. Get instant Dacotah Speedway updates by texting the word "speedway" to 20691. 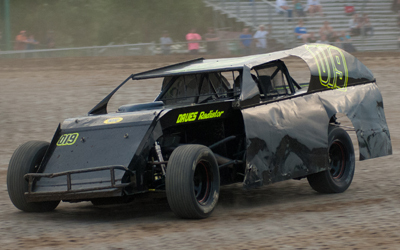 You can also follow us on Twitter, @dacotahspeedway or on our YouTube channel.